This is both Solange and my first child, so we have really no expectations for our kid. I think that is a good thing. Solange brought Teddy to the doctor for cradle cap, and the doctor also exclaimed that Teddy looked big for his age. This does not make sense since Solange is petite, and no one in my family is above average in size. I found a chart on the internet, and Teddy is OFF the charts! Check out this chart, that plots his growth since birth versus the percentiles. He is over the 99th percentile. 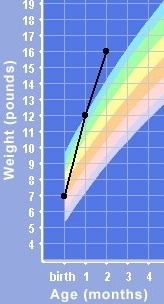 We have not been tracking height as much but Teddy is not fat, he is also in the 99th percentile in height. I have visions of the NBA in my mind. Or maybe an NFL lineman. I sure hope that he doesn’t become a Sumo wrestler. My Dad says that maybe we should sell Solange’s milk! If he keeps up this growth rate, what will he weigh at 1 year?